Making prints on leaves is a hit and miss affair. There are a few factors outside of your control that will affect the final outcome, such as the amount of sunshine, the type of leaf and its reaction to the available sun. The key area to focus on is creating a good positive as this will make the world of difference to your success rate. You need a digital image that you can convert to black and white. You can use Photoshop or an equivalent program or windows photo viewer. You may need to adjust the brightness and contrast. Aim at creating a positive that is even enough in tonal range to achieve maximum detail yet still with enough contrast to make it dynamic. The tonal range of a leaf is narrower than photographic paper. Avoiding photos with large areas of strong darks and highlights will help improve your results. You can use a photocopier to copy images or drawings from books, text and most importantly kids drawings onto transparency, use the black & white copy setting. You may need to adjust the contrast and brightness. You can use OHP transparency to draw on, creating an image with a black permanent marker. Make two copies of an inkjet print or photocopy, this creates more density and therefore more detail in the final print. I don’t believe this is necessary for drawings on OHP or images they are only black or white with no grey tones. I sellotape the two copies together and then sellotape another layer of transparency over the exposed ink of the print so that it doesn’t stick to the leaf or the glass becoming ruined, the positives should be kept and looked after as they are not throw away items. You can use film negatives but if the image is in negative the print on the left will also be in negative. Pick a leaf that the image will mostly fit on, or that the important parts of the image will fit onto it. Select leaves that are soft and reasonably dark, avoid hard waxy leaves. 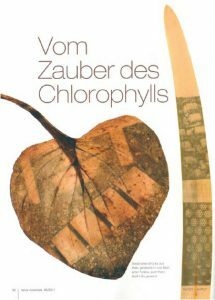 Plants that grow in shaded areas, the under-story of the forest, tend to work well such as Arum Lily, Rengarenga Lily, Nasturtium, hosta. Use leafy green vegetables like spinach, Bok choy, Broccoli leaves. Weeds tend to work well. Leaves of trees are trickier, look for soft leaves, surprising broadleaf can work. Separate the glass from contact printing frame, put the leaf on the surface of the frame, put the positive on top of it and sandwich it with the glass and fix in place. Make sure the leaf is as flat as possible, make sure the frame is very firmly sandwiched together. If the leaf has a particularly solid stem you can build up the surface behind the leaf with card until you can achieve good contact with the positive. Where the leaf is not in contact with the positive the image will be fuzzy. I put this in the sun and depending on the sunlight I check it during the day or in a couple of days. Contact printing frames have a hinge at the back so you can undo half the frame and pull the leaf away from the positive to see how much it has developed. Each leaf will react differently every time, but you will start to get a feel for when the leaf has reached its optimum. 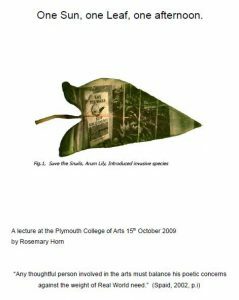 Once the image is on the leaf, the leaf will be very thin and very delicate, as they dry out completely they can become quite brittle so it is important have a book or folder to store them in, something with quite firm pages. To mount them I used some acid free glue and used a small amount to fix them to some Acid free card / matt board. These images are unfixed, so if you choose to display them bear this in mind. You can always make more. Making Anthotypes is slightly more predictable than using leaves. They have less tonal range than the leaves so image choice becomes very important. Choosing bold simple images will improve your success. You can also use flat objects such as leaves, flowers, shapes cut out of paper or use drawings on OHP. 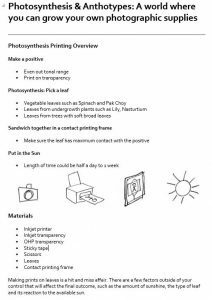 See instructions for Photosynthesis printing. Select plants for juicing that have a strong colour, the darker the better as you will get a deeper tonal range. I have found Silverbeet, Red cabbage and beetroot to be very successful. Berries and petals from flowers can also be very successful. Once again give anything a try. If you have a juicer then use this as per the instructions. Strain the juice through fine cloth into a clean bowl to remove any bit of plant pulp. Chop up the plants as finely as possible, if using silverbeet cut most of the stalk out and throw in the compost. The plant needs to be mashed as much as possible, you can use a mortar & pestle, food processor, stick blender, I have used a sieve and the end of a rolling pin in the past. Do not add water to make it easier to blend as this only waters down the juice. Put the plant pulp and any liquid into a fine piece of cloth, squeeze over a clean bowl, keep mashing and squeezing until you have enough juice. You can coat the paper in daylight unlike most photographic processes that require a darkened room. Paint the juice onto paper using a soft brush to avoid too many distracting brush marks. You may want to apply a number of coats to build up density. The paper needs to be at least 250gsm usable for watercolour or printing and have a smooth finish. The thicker the paper the better as thin paper tends to buckle as it dries. If the paper has a rough surface it won’t produce a good print because it’s hard to see detail. Place the positive on top of the coated paper and secure in the contact printing frame firmly so it doesn’t slip. Check every day to see how it is developing as the length of time it will take to develop will depend on how sunny it is.